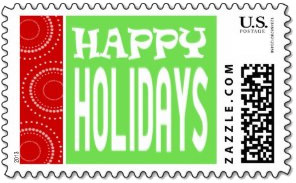 Each Happy Holidays Stamp is available in three sizes and all denominations. 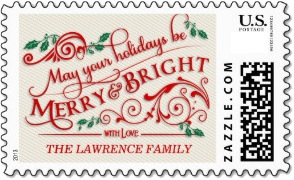 Click through any stamp to see your options for creating a personalized Holiday stamp. 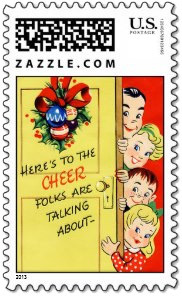 A very 1950s retro cartoon holiday stamp with a family of four peaking out from behind a door. Fun holiday stamp for holiday party invitations. 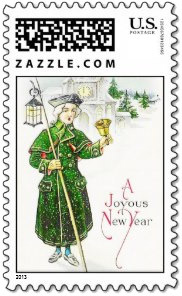 This vintage holiday stamp has the town crier ringing in A Joyous New Year. 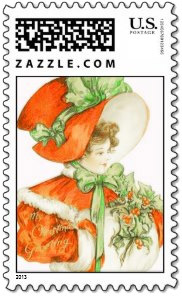 The large red hat and jacket make quite a nice outfit for the woman on this red hat vintage holiday stamp. Warm and comfortable. 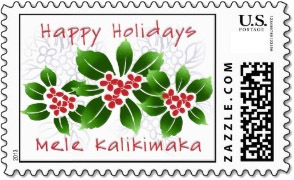 An Hawaiian Christmas stamp with Happy Holidays above a tropical interpretation of holly in bright colors and subtle gradients. The lettering is dusted with snow . A personalized holiday stamp with swirling red text wish a merry and bright holiday with your name at the bottom. Very nice. Pastel ornaments hanging against a rainbow of swirling purples with white text: Happy Holidays. An attractive happy holidays postage stamp. Perfect for your upcoming holiday celebrations. This personalized happy holidays stamp features party guests in silhouette enjoying themselves on a red polka dot background. The text is fully customizable for your own holiday greeting. Holiday trees in different designs with snowflakes and "Happy Holidays" at the bottom in a swirly font inside an orange border. Matching cards available for this cute happy holidays stamp. This Christmas stamp has a photograph of some beautiful red poinsettias filling the entire frame. Happy Holidays Stamp with silver snowflakes in the white background and swirly red text. Golden "Season's Greetings" on a burgundy background, you add your personal text to the last line on this holiday stamp. Art Deco inspired design for the Holiday season. Black and white walk amongst snow covered pine trees. Red ornaments dangle against a frosty red background and "Season's Greetings" in white. 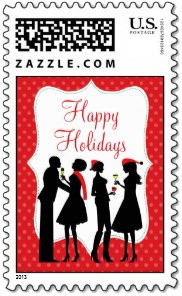 Easily add your black and white or color photo to this Happy Holidays stamp. Your photo will load behind the red and green Happy Holidays banner. Elegant gold ornament with "seasons Greetings" make up this holiday stamp. This holiday stamp has a rich red background with swirly "Happy Holidays" text. You personalize the last line of script. Elegant gold star topped tree with fireworks and a swirly font for "Seasons Greeting" make this a stylish holiday stamp. Cute holiday Panda with a gold bow on his neck and holly in his lap against a red background. A colorful holiday stamp. A fun design for your season's greetings. A cocktail glass with a cocktail pick has an elf hat on the end and elf legs dangling the edge of the glass rather than the traditional paper umbrella. Bright, whimsical Happy Holidays stamp with a Peace dove. Lots of motion in the design with a happy sun in the background. 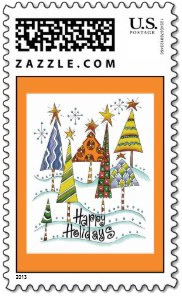 A colorful Happy Holidays stamp. Two silver jingle bells and their reflections against a white background. Simple and stylish. No words needed. Easily upload your photo and change any of the foreground snowbank text. 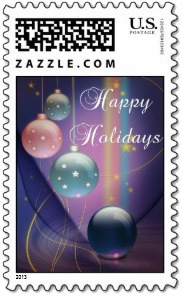 A fun Happy Holidays postage stamp. A Holiday Greetings stamp with a graduated red background and a golden ivy treatment around the text.